I took a long time over the Winter to mull over the year, and think about the future. It was difficult sometimes, but absolutely crucial to Reddy Lane growing. I am engaging in negotiations about the future with my landlords, I have spreadsheet after spreadsheet on sales figures & projections, a spreadsheet showing me when to weed/sow/harvest each section of the field, and I am trying to make getting my own piece of land a reality. I came across http://www.dishingupthedirt.com last year, and I love it. Andrea Bemis is farming 6 acres organically in Oregon with her husband, and her blog has recipes and fantastic photos of her meals and her farm. Being a woman and being a farmer can feel like you are a little out on a limb. Peer support is somewhat lacking. So, this excellent blog helps and some of the recipes I’ve followed have been great. I very much aspire to including information on what to eat with seasonal and local produce on this website. Following it on Instagram also signposted me to other organic farms in the US that were posting about their own veg and cooking. Ones I really like are: jbgorganic, high mowing organic seeds, revolution farm, pitchforkandcrow, evenpullfarm, sassafras creek farm, quarter branch farm, happy acre farm, jeffsorganicproduce, icecaporganics and transition farm robin. Andrea Bemis shows off her lettuces at her six acre farm in Oregon. Well, the garden must be slowing down a tad, as I’ve got time to write a mid August update. But there is also lovely veg to blog and post up too….. finally! The great news is that the landlords have installed a rabbit fence at the site, so hopefully the maincrops planted out now will not go the same way as the earlies. It has been very disheartening to see crop after crop being eaten by rabbits. I’ve lost all lettuces and spinach that was sown & planted out, and the mange tout are pitiful due to nibbling. No mange tout harvested yet after three sowings. I would expect to be harvesting approx 20kg a week, so this has majorly affected finances. I finally cleared the Fat Hen and sowed lettuces and brassica salads for the Autumn/Winter. I have also planted out 21 Westphalian Kales from the cage, but there’s still a good 100 to go. And about 15 purple sprouting broccoli to go. My reckoning is that I have five big jobs to go for the season: planting out the kales and broccoli and netting them, planting out the leeks, clearing and planting salads in the polytunnel, rotavating and planting green manure, consolidating the mange tout that may still crop and re-sowing with another crop where they have failed. I hope that I can do this in the next 2-3 weeks, and then hopefully get some reprieve in my workload. Still have to keep on top of the weeding though…. I am selling my own cherry tomatoes, courgettes, broad beans, beetroot and garlic on the stall and in the veg boxes. And they are great, I am very pleased with them. I have had such an excess of beetroot, that I have also been selling some to Manchester Veg People (MVP) and Abbey Ley’s Farm Shop, which is great. I am also still selling sage and oregano to the Unicorn and MVP, though the oregano is in full flower so is taking quite a while to process. The Unicorn are also taking dill plants and hopefully soon chamomile ones. I am buying in kale, cucumbers, mange tout and potatoes from other organic growers in Cheshire and from Abbey Leys Farm Shop. So, I have the best, freshest, localest, tastiest organic veg to sell and everyone is on holiday. 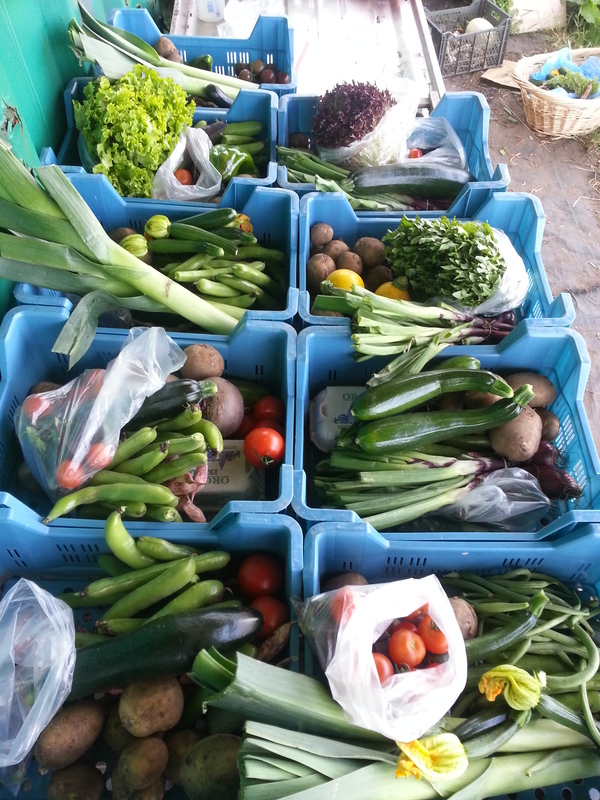 My takings at Leve Market and my veg boxes have all dropped off by almost half as it is the schools Summer holidays.